This insectivorous species is frequent in flushes and around springs or on wet rock outcrops, especially in hilly districts. The bright yellow-green leaves lie pressed against the rock or ground, curling lengthwise around small insects trapped by the sticky surface. The single flower of a beautiful blue colour is carried on a long stalk arising from the centre of the leaf rosette. 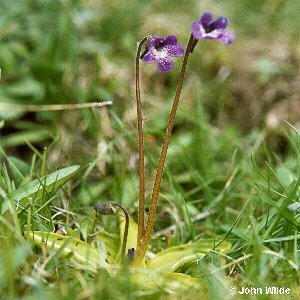 The only other Pinguicula species occurring in Northern Ireland is P. lusitanica which has much smaller and paler flowers, and with the leaves tinged with bronze. It is much less frequent. 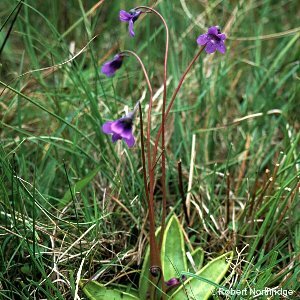 All names: Pinguicula vulgaris L.